At times I feel daunted by the task of writing book number two. Hours can go by where I force myself to stay seated to write mountains of words that I’ll have to wade through later, searching for a nugget of ‘good’. In fact, I haven’t written a blog post in ages because I felt like there was nothing positive to report from my writing lair. 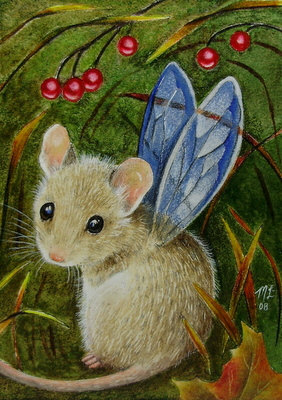 But, at the worst times, when my mind is trying desperately to run away, the loveliest idea will land like a fairy mouse on my shoulder. A moment like that is worth a month of struggle. Artwork by Melody Lea Lamb. Check out her fabulous miniature animal paintings on Etsy!